Blog Talk: Trying to be myself is hard. Especially on Instagram. If anyone has ever attempted to be successful at an online presence you probably understand exactly what I mean by this title. There are so many rules to follow. So many guidelines to success that all the helpful tips and information can leave your head in a giant, jumbled mess. What. do. you. want. from. me? I know the blog always does better when I write posts with passion that are different and helpful. –So they are true to me and helpful to others. In fact, I almost feel it in my bones that these posts will be successful. But then why don’t I/can’t I seem to write them all the time? Do I actually have that much to say? I can’t keep coming up with that many unique thoughts can I? Plus you know what? I’m not that great at “niching down.” Doing that in itself took a huge amount of discipline for me. So can’t I just be rewarded for that by writing DIY and budgeting posts from here until eternity? No? Yeah, ok.
Did you just get goosebumps? Me too. Do you know how awkward it is to take an Insta-worthy photo? Believe it or not, I don’t walk around snapping selfies of myself all day long. Maybe when I was 13 with my disposable camera, but definitely not anymore. Side note…does this mean I am actually the inventor of the selfie? What’s even more awkward is trying to get my husband to take photos of me where I totally pretend I’m not expecting a photo to be taken. Checkout my Instagram. Yup. I forced him to take this. And…*face palm* I totally love it. The hotel even asked to use it too! As awkward as it is to take these photos I can’t deny the fact that I love them. The best part? 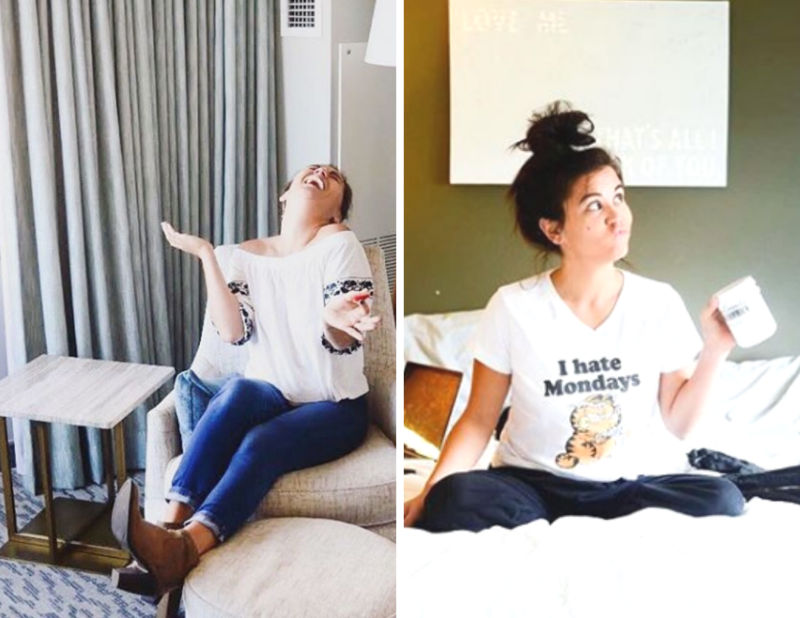 This hotel weekend getaway was totally free…because I blogged about it…and took cheesy, Insta worthy pictures. So you know what? When all is said and done…I’m happy to do it. See the feed. You know who is actually super good at this? My older daughter, Dezy. It has to be because she’s the “Instagram Generation” right? No doubt she has spent countless hours studying all the not-posed photos of Instagram more than I have. Seriously…look at her work. I actually didn’t know when she was taking photos. This is a legit hair toss photo. I mean. I feel like Cindy Crawford. Thank goodness I have someone who knows how to take pictures of me being myself because otherwise I wouldn’t know how to do it. Create beautiful tutorials and helpful DIYs for the blog when I actually have no idea what I’m doing and should probably invest in a life coach. Continue striving for a beautiful, cohesive Instagram feed that looks tranquil and light when really I’m a hot mess of a human being and my real Instagram feed would look like someone dumped a bucket of pink glitter on a Hot Topic store. We’re all in this together, right? Right? Hello? This is what’s on my mind today and you know what? If you are working at building an online presence for yourself, I bet it’s on your mind too. So, this is your friendly reminder that we are all facing an identity crisis. Maybe it is just me. I can’t say I would be surprised to hear that I’m wired differently. It shows. I love you and I love your Instagram 😆. Glad you let yout your inner goofball too! Haha thank you, thank you.